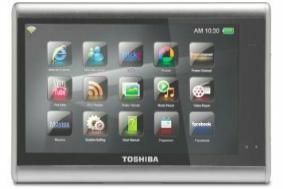 IFA NEWS: Toshiba takes multimedia on the move with touchscreen Journe Touch | What Hi-Fi? Available in the next couple of months, it has a 7in 16:9 touchscreen interface, 802.11b/g wireless connectivity, and uses the WinCE 6.0 Pro operating system. The screen is 800x480 pixels, with LED backlighting, and the unit supports MPEG 4/H.264, WMA and MP3 audio and JPEG/BMP pictures. 1GB of storage is standard, and the Journe Touch can accept SD cards up to 32GB for expansion. MMC, MS and MS Pro, and xD cards can also be used. As well as its onboard Wi-Fi connectivity, the Toshiba can accept an external USB adapter for 3.5G mobile internet, and comes preloaded with Internet Explorer 6 and Windows Multimedia Player 9.0. Both USB 1.1 A-type and USB2.0 Mini-B ports are provided. It also supports social networking services such as YouTube, AceTrax, FrameChannel, Picasa, Flickr, and MSN Messenger, and can also manage RSS feeds for content updates. Built-in speakers are powered by 0.5W amplification, and an optional cradle will provide an HDMI output for HD Ready TVs. The unit uses a high-capacity Lithium-ion polymer battery providing up to seven hours of audio playback. No pricing is yet available on the Journe Touch, but Toshiba says it will be competitive with similar devices already on the market.